Fifteen years ago, this garden was a blank canvas. The hedges, mostly yew and box, went in during the second year. Planted as rather small, insignificant bare root plants, I never thought that within a decade, the garden would look as if they had been there for ever. They are, together with the ivy-covered wall, very much the bones of the garden. 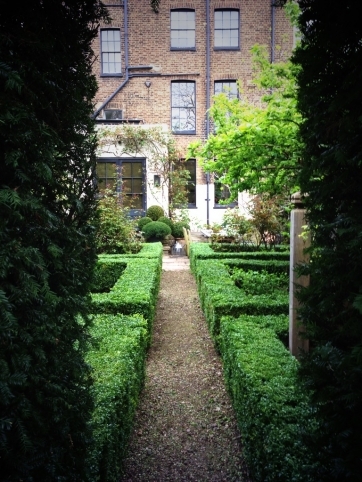 Each May, occasionally June, Katie trims the hedges, and for a couple of weeks the garden looks as smart as a button. This usually coincides with the latest batch of fox cubs reaching the age where they start to explore. It takes just a matter of days before they discover that a freshly trimmed hedge can make a good bouncy castle. I relish the clipped box and yew. The black-green of the yew, the shade it gives, and the dark backdrop it offers for the acid greens of the orange blossom, is something for which I am grateful. The box frames the beds, allowing a riot of annuals to always appear in control. Without the formality of the hedges, this garden would look unruly and chaotic. Right now, the hedges are crisp and straight. Soon their new leaves will appear, a pale sage green at first, giving a soft scruffiness to the garden I like. A look I rather like in people too.